For peace of the whole world, for the stability of the holy churches of God, and for the unity of all, let us pray to the Lord. For our Archbishop (Name), our Bishop (Name), the honorable presbyters, the deacons in the service of Christ, and all the clergy and laity, let us pray to the Lord. For this parish and city, for every city and country, and for the faithful who live in them, let us pray to the Lord. Lord, our God, whose power is beyond compare, and glory is beyond understanding; whose mercy is boundless, and love for us is ineffable; look upon us and upon this holy house in Your compassion. Grant to us and to those who pray with us Your abundant mercy. For to You belong all glory, honor, and worship to the Father and the Son and the Holy Spirit, now and forever and to the ages of ages. By the intercessions of the Theotokos, Savior, save us (3). In peace let us again pray to the Lord. Lord, our God, save Your people and bless Your inheritance; protect the whole body of Your Church; sanctify those who love the beauty of Your house; glorify them in return by Your divine power; and do not forsake us who hope in You. For Yours is the dominion, the kingdom, the power, and the glory of the Father and the Son and the Holy Spirit, now and forever and to the ages of ages. Save us, O Son of God, (who rose from the dead), to You we sing: Alleluia (3). Only begotten Son and Word of God, although immortal You humbled Yourself for our salvation, taking flesh from the holy Theotokos and ever virgin Mary and, without change, becoming man. Christ, our God, You were crucified but conquered death by death. You are one of the Holy Trinity, glorified with the Father and the Holy Spirit – save us. Lord, You have given us grace to offer these common prayers with one heart. You have promised to grant the requests of two or three gathered in Your name. Fulfill now the petitions of Your servants for our benefit, giving us the knowledge of Your truth in this world, and granting us eternal life in the world to come. For You are a good and loving God, and to You we give glory, to the Father and the Son and the Holy Spirit, now and forever and to the ages of ages. Master and Lord our God, You have established in heaven the orders and hosts of angels and archangels to minister to Your glory. Grant that the holy angels may enter with us that together we may serve and glorify Your goodness. For to You belong all glory, honor, and worship to the Father and the Son and the Holy Spirit, now and forever and to the ages of ages. Amen. Blessed is the entrance of Your saints always, now and forever and to the ages of ages. Amen. Come, let us worship and bow before Christ. Save us, O Son of God who rose from the dead, to You we sing: Alleluia. Holy God, You dwell among Your saints. You are praised by the Seraphim with the thrice holy hymn and glorified by the Cherubim and worshiped by all the heavenly powers. You have brought all things out of nothing into being. You have created man and woman in Your image and likeness and adorned them with all the gifts of Your grace. You give wisdom and understanding to the supplicant and do not overlook the sinner but have established repentance as the way of salvation. You have enabled us, Your lowly and unworthy servants, to stand at this hour before the glory of Your holy altar and to offer to You due worship and praise. Master, accept the thrice holy hymn also from the lips of us sinners and visit us in Your goodness. Forgive our voluntary and involuntary transgressions, sanctify our souls and bodies, and grant that we may worship and serve You in holiness all the days of our lives, by the intercessions of the holy Theotokos and of all the saints who have pleased You throughout the ages. …and to the ages of ages. Amen. Holy God, Holy Mighty, Holy Immortal, have mercy on us (3). Glory to the Father and to the Son and to the Holy Spirit, now and forever and to the ages of ages. Amen. Holy Immortal, have mercy on us. Blessed are You on the throne of glory of Your kingdom, seated upon the Cherubim, now and forever and to the ages of ages. Amen. The reading is from (The name of the book of the New Testament from which the Apostolic reading is taken). Shine within our hearts, loving Master, the pure light of Your divine knowledge and open the eyes of our minds that we may comprehend the message of your Gospel. Instill in us, also, reverence for Your blessed commandments, so that having conquered sinful desires, we may pursue a spiritual life, thinking and doing all those things that are pleasing to You. For You, Christ our God, are the light of our souls and bodies, and to You we give glory together with Your Father who is without beginning and Your all holy, good, and life giving Spirit, now and forever and to the ages of ages. Amen. Wisdom. Arise. Let us hear the holy Gospel. Peace be with all. The reading is from the holy Gospel according to (Name). Let us be attentive. O Lord Almighty, the God of our Fathers, we beseech Thee, hear us and have mercy. Have mercy upon us, O God, according to Thy great goodness, we beseech Thee, hear us and have mercy. Furthermore we pray for this country, its ruler, (title and name of the ruler), its people, civil authorities and armed forces. Furthermore we pray for our Most Reverend Bishop (name of the diocesan bishop, or, if he be an archbishop or metropolitan, mention his rank and name), and for all the Orthodox bishops. Furthermore we pray for our brethren: priests, deacons, monks and all other clergy, and for all our brethren in Christ. 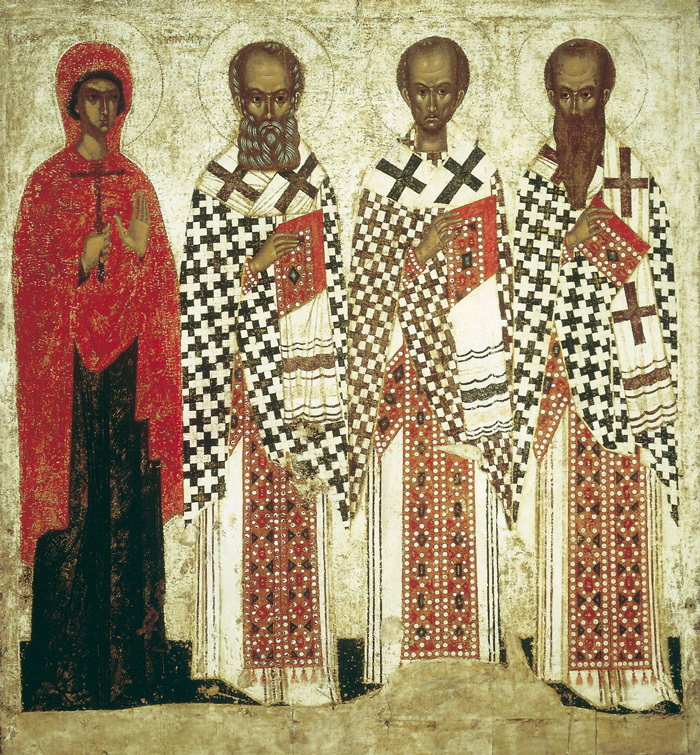 Furthermore we pray for the blessed ever-memorable and most holy Orthodox patriarchs, for devout kings and rightbelieving queens, for the blessed founders of this holy church and for all our Orthodox fathers, brethren, and sisters departed from this life before us, and who rest in peace here and everywhere. Furthermore we pray for mercy, life, peace, health, salvation, visitation, forgiveness and remission of the sins of the servants of God: benefactors, trustees, members and supporters of this holy church. Furthermore we pray for those who bring offerings and do good works in this holy and all-venerable church; for those who labor in its service, for the singers and for the people here present, who await from Thee great and abundant mercy. O Lord our God, accept this fervent supplication from Thy servants, and have mercy upon us according to the multitude of Thy mercies; and send forth Thy compassion upon us and upon all Thy people, who await the rich mercy that cometh from Thee. For Thou art a merciful God and lovest mankind, and unto Thee we ascribe glory to the Father, and to the Son, and to the Holy Spirit, now and ever, and unto ages of ages. Have mercy upon us, O God, according to Thy great mercy, we beseech Thee: hear us, and have mercy. Furthermore we pray for the repose of the soul(s) of the servant(s) of God (name-s of the deceased), departed from this life, and that Thou wilt pardon all his (or her or their) sins, both voluntary and involuntary. That the Lord God will establish his (or her or their) soul(s) where the just repose. The mercies of God, the Kingdom of Heaven, and the remission of his (or her or their) sins, we ask of Christ, or King Immortal and our God. O God of spirits, and of all flesh, Who hast trampled down death by death, and overthrown the Devil, and hast bestowed life upon Thy world: do Thou Thyself, O Lord, grant rest to the soul(s) of Thy departed servant(s), (name-s of the deceased), in a place of brightness, a place of verdure, a place of repose, whence all sickness, sorrow and sighing have fled away. As the gracious God, Who lovest mankind, pardon every transgression which he (or she or they) has (or have) committed, whether by word, or deed, or thought. For Thou alone art without sin, and Thy righteousness is to all eternity, and Thy word is truth. For Thou art the Resurrection, and the Life, and the Repose of Thy departed servant(s) (name-s of the deceased). O Christ our God, and unto Thee we ascribe gory, together with Thy Father, Who is from everlasting, and Thine All-Holy, and Good and Life-Giving Spirit, now and ever, and unto ages of ages. Pray unto the Lord, ye catechumens. Ye faithful, pray ye for the catechumens, that the Lord may have mercy upon them. That He may reveal to them the Gospel of righteousness. Save them, have mercy upon them, preserve them, and protect them, O God, by Thy grace. O Lord, our God, Who dwellest on high and regardest the humble of heart; Who hast sent forth as the salvation of mankind Thine Only-begotten Son and God, our Lord Jesus Christ; look down upon Thy servants, the catechumens, who have bowed their heads before Thee; make them worthy in due season of the laver of regeneration. Unite them to thy Holy, Universal and Apostolic Church, and number them with Thy chosen flock. That they also with us may glorify Thy most honorable and majestic Name of the Father, and of the Son and of the Holy Spirit, now and ever and unto ages of ages. All ye catechumens, depart! Depart, ye catechumens! All ye that are catechumens, depart! Let no catechumens remain! But let us who are of the faithful, again and again, in peace pray to the Lord. We give thanks unto Thee, O Lord God of the Powers, Who hast accounted us worthy to stand even now before Thy holy altar, and to prostrate ourselves before Thy compassion for our sins and errors of the people. Accept our supplications, O God; make us worthy to offer unto Thee prayers and supplications, and bloodless sacrifices for all Thy people. And enable us, whom Thou hast appointed in this Thy ministry, by the power of Thy Holy Spirit, blamelessly and without offense, in the pure testimony of our conscience, to call upon Thee at all times and in every place; that hearing us, Thou mayest show mercy upon us according to the multitude of Thy goodness. Help us, save us have mercy upon us and protect us, O god, by Thy grace. For unto Thee are due all glory, honor, and worship, to the Father, and to the Son and to the Holy Spirit, now and ever, and unto ages of ages. Again, we bow before You and pray to You, O good and loving God. Hear our supplication: cleanse our souls and bodies from every defilement of flesh and spirit, and grant that we may stand before Your holy altar without blame or condemnation. Grant also, O God, progress in life, faith, and spiritual discernment to the faithful who pray with us, so that they may always worship You with reverence and love, partake of Your Holy Mysteries without blame or condemnation, and become worthy of Your heavenly kingdom. And grant that always guarded by Your power we may give glory to You, the Father and the Son and the Holy Spirit, now and forever and to the ages of ages. No one bound by worldly desires and pleasures is worthy to approach, draw near or minister to You, the King of glory. To serve You is great and awesome even for the heavenly powers. But because of Your ineffable and immeasurable love for us, You became man without alteration or change. You have served as our High Priest, and as Lord of all, and have entrusted to us the celebration of this liturgical sacrifice without the shedding of blood. For You alone, Lord our God, rule over all things in heaven and on earth. You are seated on the throne of the Cherubim, the Lord of the Seraphim and the King of Israel. You alone are holy and dwell among Your saints. You alone are good and ready to hear. Therefore, I implore You, look upon me, Your sinful and unworthy servant, and cleanse my soul and heart from evil consciousness. Enable me by the power of Your Holy Spirit so that, vested with the grace of priesthood, I may stand before Your holy Table and celebrate the mystery of Your holy and pure Body and Your precious Blood. To You I come with bowed head and pray: do not turn Your face away from me or reject me from among Your children, but make me, Your sinful and unworthy servant, worthy to offer to You these gifts. For You, Christ our God, are the Offerer and the Offered, the One who receives and is distributed, and to You we give glory, together with Your eternal Father and Your holy, good and life giving Spirit, now and forever and to the ages of ages. Amen. Having beheld the resurrection of Christ, let us worship the holy Lord Jesus, the only Sinless One. We venerate Your cross, O Christ, and we praise and glorify You holy resurrection. You are our God. We know no other than You, and we call upon Your name. Come, all faithful, let us venerate the holy resurrection of Christ. For behold, through the cross joy has come to all the world. Blessing the Lord always, let us praise His resurrection. For enduring the cross for us, he destroyed death by death. Have mercy upon me, O God, according to Your great mercy; and according to the multitude of Your compassion, blot out my transgression. Wash me thoroughly from my iniquity, and cleanse me from my sin. For I acknowledge my iniquity, and my sin is ever before me. Against You, You only, have I sinned, and done evil in Your sight, that You may be found just when You speak, and victorious when You are judged. For behold, I was conceived in iniquity, and in sin my mother bore me. For behold, You have loved truth; You have made known to me the secret and hidden thing of Your wisdom. you shall sprinkle me with hyssop, and I shall be made clean; You shall wash me, and I shall be whiter than snow. Make me to hear joy and gladness, that the afflicted bones may rejoice. Turn Your face away from my sins, and blot out all my iniquities. Create in me a clean heart, O God, and renew a steadfast spirit within me. Cast me not away from Your presence, and take not Your Holy Spirit from me. Restore to me the joy of Your salvation, and establish me with Your governing Spirit. I shall teach transgressors Your ways, and the ungodly shall turn back to You. Deliver me from bloodguiltiness, O God, the God of my salvation, and my tongue shall joyfully declare Your righteousness. Lord, open my lips, and my mouth shall proclaim Your praise. For if You had desired sacrifice, I would give it; You do not delight in burnt offerings. A sacrifice to God is a broken spirit; God will not despise a broken and a humbled heart. Do good in Your good pleasure to Sion; and let the walls of Jerusalem be built. Then You shall be pleased with a sacrifice of righteousness, with oblation and whole burnt offerings. Then they shall offer bulls on Your altar. May the Lord God remember all of you in His kingdom, now and forever and to the ages of ages. …invisibly escorted by the angelic hosts. Alleluia. Alleluia. Alleluia. For a perfect, holy, peaceful, and sinless day, let us ask the Lord. For all that is good and beneficial to our souls, and for peace in the world, let us ask the Lord. For the completion of our lives in peace and repentance, let us ask the Lord. For a Christian end to our lives, peaceful, without shame and suffering, and for a good account before the awesome judgment seat of Christ, let us ask the Lord. Lord, God Almighty, You alone are holy. You accept a sacrifice of praise from those who call upon You with their whole heart. Receive also the prayer of us sinners and let it reach Your holy altar. Enable us to bring before You gifts and spiritual sacrifices for our sins and for the transgressions of the people. Make us worthy to find grace in Your presence so that our sacrifice may be pleasing to You and that Your good and gracious Spirit may abide with us, with the gifts here presented, and with all Your people. Through the mercies of Your only begotten Son with whom You are blessed, together with Your all holy, good, and life giving Spirit, now and forever and to the ages of ages. I love You, Lord, my strength. The Lord is my rock, and my fortress, and my deliverer. Father, Son, and Holy Spirit, Trinity one in essence and inseparable. Guard the doors. Wisdom. Let us be attentive. Let us stand well. Let us stand in awe. Let us be attentive, that we may present the holy offering in peace. Mercy and peace, a sacrifice of praise. The grace of our Lord Jesus Christ, and the love of God the Father, and the communion of the Holy Spirit, be with all of you. Holy, holy, holy, Lord Sabaoth, heaven and earth are filled with Your glory. Hosanna in the highest. Blessed is He who comes in the name of the Lord. Hosanna to God in the highest. Take, eat, this is my Body which is broken for you for the forgiveness of sins. Drink of it all of you; this is my Blood of the new Covenant which is shed for you and for many for the forgiveness of sins. We offer to You these gifts from Your own gifts in all and for all. We praise You, we bless You, we give thanks to You, and we pray to You, Lord our God. And that which is in this cup the precious Blood of Your Christ. So that they may be to those who partake of them for vigilance of soul, forgiveness of sins, communion of Your Holy Spirit, fulfillment of the kingdom of heaven, confidence before You, and not in judgment or condemnation. Again, we offer this spiritual worship for those who repose in the faith, forefathers, fathers, patriarchs, prophets, apostles, preachers, evangelists, martyrs, confessors, ascetics, and for every righteous spirit made perfect in faith. Especially for our most holy, pure, blessed, and glorious Lady, the Theotokos and ever virgin Mary. It is truly right to bless you, Theotokos, ever blessed, most pure, and mother of our God. More honorable than the Cherubim, and beyond compare more glorious than the Seraphim, without corruption you gave birth to God the Word. We magnify you, the true Theotokos. For Saint John the prophet, forerunner, and baptist; for the holy glorious and most honorable Apostles; for Saint(s) (Name-s), whose memory we commemorate today; and for all Your saints, through whose supplications, O God, bless us. Remember also all who have fallen asleep in the hope of resurrection unto eternal life. (Here the priest commemorates the names of the deceased.) And grant them rest, our God, where the light of Your countenance shines. Again, we ask You, Lord, remember all Orthodox bishops who rightly teach the word of Your truth, all presbyters, all deacons in the service of Christ, and every one in holy orders. We also offer to You this spiritual worship for the whole world, for the holy, catholic, and apostolic Church, and for those living in purity and holiness. And for all those in public service; permit them, Lord, to serve and govern in peace that through the faithful conduct of their duties we may live peaceful and serene lives in all piety and holiness. Above all, remember, Lord, our Archbishop (Name) and our Bishop (Name): Grant that they may serve Your holy churches in peace. Keep them safe, honorable, and healthy for many years, rightly teaching the word of Your truth. Remember also, Lord, those whom each of us calls to mind and all Your people. Remember, Lord, the city in which we live, every city and country, and the faithful who dwell in them. Remember, Lord, the travelers, the sick, the suffering, and the captives, granting them protection and salvation. Remember, Lord, those who do charitable work, who serve in Your holy churches, and who care for the poor. And send Your mercy upon us all. And grant that with one voice and one heart we may glorify and praise Your most honored and majestic name, of the Father and the Son and the Holy Spirit, now and forever and to the ages of ages. The mercy of our great God and Savior Jesus Christ be with all of you. Having remembered all the saints, let us again in peace pray to the Lord. For the precious Gifts offered and consecrated, let us pray to the Lord. That our loving God who has received them at His holy, heavenly, and spiritual altar as an offering of spiritual fragrance, may in return send upon us divine grace and the gift of the Holy Spirit, let us pray. We entrust to You, loving Master, our whole life and hope, and we ask, pray, and entreat: make us worthy to partake of your heavenly and awesome Mysteries from this holy and spiritual Table with a clear conscience; for the remission of sins, forgiveness of transgressions, communion of the Holy Spirit, inheritance of the kingdom of heaven, confidence before You, and not in judgment or condemnation. For Yours is the kingdom and the power and the glory of the Father and the Son and the Holy Spirit, now and forever and to the ages of ages. We give thanks to You, invisible King. By Your infinite power You created all things and by Your great mercy You brought everything from nothing into being. Master, look down from heaven upon those who have bowed their heads before You; they have bowed not before flesh and blood but before You the awesome God. Therefore, Master, guide the course of our life for our benefit according to the need of each of us. Sail with those who sail; travel with those who travel; and heal the sick, Physician of our souls and bodies. By the grace, mercy, and love for us of Your only begotten Son, with whom You are blessed, together with Your all holy, good, and life giving Spirit, now and forever and to the ages of ages. Lord Jesus Christ, our God, hear us from Your holy dwelling place and from the glorious throne of Your kingdom. You are enthroned on high with the Father and are also invisibly present among us. Come and sanctify us, and let Your pure Body and precious Blood be given to us by Your mighty hand and through us to all Your people. Praise the Lord from the heavens; praise Him in the highest. Alleluia (3). The fullness of the Holy Spirit. Amen. Blessed is the fervor of Your saints, now and forever and to the ages of ages. Amen. The warmth of the Holy Spirit. Amen. I believe and confess, Lord, that You are truly the Christ, the Son of the living God, who came into the world to save sinners, of whom I am the first. I also believe that this is truly Your pure Body and that this is truly Your precious Blood. Therefore, I pray to You, have mercy upon me, and forgive my transgressions, voluntary and involuntary, in word and deed, known and unknown. And make me worthy without condemnation to partake of Your pure Mysteries for the forgiveness of sins and for life eternal. Amen. Behold, I approach Christ, our immortal King and God. The precious and most holy Body of our Lord, God, and Savior Jesus Christ is given to me (Name) the priest, for the forgiveness of my sins and eternal life. This has touched my lips, taking away my transgressions and cleansing my sins. Having beheld the resurrection of Christ, let us worship the holy Lord Jesus, the only Sinless One. We venerate Your cross, O Christ, and we praise and glorify Your holy resurrection. You are our God. We know no other than You, and we call upon Your name. Come, all faithful, let us venerate the holy resurrection of Christ. For behold, through the cross joy has come to all the world. Blessing the Lord always, let us praise His resurrection. For enduring the cross for us, He destroyed death by death. Approach with the fear of God, faith, and love. The servant of God (Name) receives the Body and Blood of Christ for forgiveness of sins and eternal life. Save, O God, Your people and bless Your inheritance. We have seen the true light; we have received the heavenly Spirit; we have found the true faith, worshiping the undivided Trinity, for the Trinity has saved us. Wash away, Lord, by Your holy Blood, the sins of all those commemorated, through the intercessions of the Theotokos and all Your saints. Amen. Be exalted, O God, above the heavens. Let Your glory be over all the earth (3). Let our mouths be filled with Your praise, Lord, that we may sing of Your glory. You have made us worthy to partake of Your holy mysteries. Keep us in Your holiness, that all the day long we may meditate upon Your righteousness. Alleluia. Alleluia. Alleluia. Let us be attentive. Having partaken of the divine, holy, pure, immortal, heavenly, life giving, and awesome Mysteries of Christ, let us worthily give thanks to the Lord. Having prayed for a perfect, holy, peaceful, and sinless day, let us commit ourselves and one another, and our whole life to Christ our God. We thank You, loving Master, benefactor of our souls, that on this day You have made us worthy once again of Your heavenly and immortal Mysteries. Direct our ways in the right path, establish us firmly in Your fear, guard our lives, and make our endeavors safe, through the prayers and supplications of the glorious Theotokos and ever virgin Mary and of all Your saints. Lord, bless those who praise You and sanctify those who trust in You. Save Your people and bless Your inheritance. Protect the whole body of Your Church. Sanctify those who love the beauty of Your house. Glorify them in return by Your divine power, and do not forsake us who hope in You. Grant peace to Your world, to Your churches, to the clergy, to those in public service, to the armed forces, and to all Your people. For every good and perfect gift is from above, coming from You, the Father of lights. To You we give glory, thanksgiving, and worship, to the Father and the Son and the Holy Spirit, now and forever and to the ages of ages. Blessed is the name of the Lord, both now and to the ages (3). Christ our God, You are the fulfillment of the Law and the prophets. You have fulfilled all the dispensation of the Father. Fill our hearts with joy and gladness always, now and forever and to the ages of ages. Amen. Lord, have mercy (3.) Father, give the blessing. May the blessing of the Lord and His mercy come upon you through His divine grace and love always, now and forever and to the ages of ages. May Christ our true God (who rose from the dead), as a good, loving, and merciful God, have mercy upon us and save us, through the intercessions of His most pure and holy Mother; the power of the precious and life-giving Cross; the protection of the honorable, bodiless powers of heaven; the supplications of the honorable, glorious, prophet, and forerunner John the Baptist; the holy, glorious, and praiseworthy apostles; the holy, glorious, and triumphant martyrs; our holy and God-bearing Fathers (name of the church); the holy and righteous ancestors Joachim and Anna; Saint (of the day) whose memory we commemorate today, and all the saints. Lord, grant long life to him who blesses and sanctifies us.